The biggest change to note is that WP-Client is compatible with WordPress 4.5 as of WP-Client v.4.0.1. 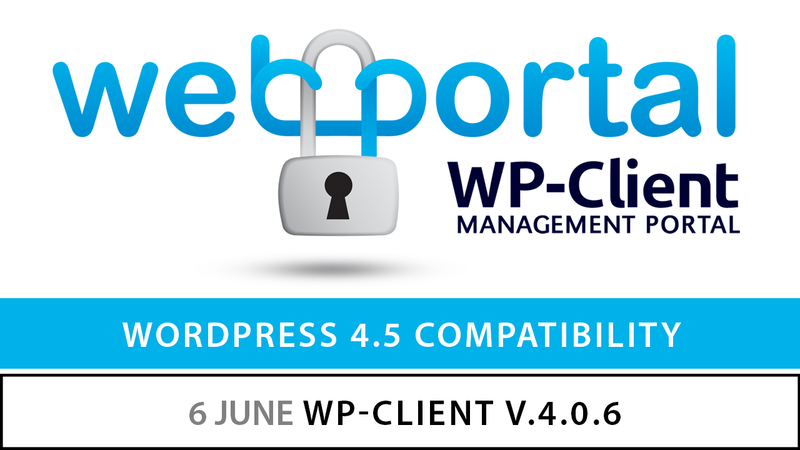 Additionally, the latest version of WP-Client (4.0.6) is tested and fully compatible with the current latest release of WordPress (4.5.2). If you are currently running WordPress 4.5 or above, and have not yet updated your WP-Client to at least version 4.0.1, we would highly recommend doing so to avoid any potential conflicts. Additionally, after updating, we recommend performing the “reset to default” steps for all of the shortcode templates within your installation, including those for file sharing, and client registration. If you have any customizations that have been made to any of these templates, we would suggest saving your existing templates to text files before performing the resets. A smaller but useful addition in this recent update is the new shortcode for displaying client avatars, “wpc_client_avatar_preview”. This shortcode (when placed inside square brackets in a page) will display a client’s assigned avatar image wherever the shortcode is placed. You can use this to build a custom profile page for your clients, to help clients easily find their data, or a myriad of other uses. Another addition that was added at the request of some clients is related to the “private for” shortcode, that is used to protect/privatize specific data that is contained within the corresponding shortcodes. When originally conceived, the shortcodes use Client usernames and Circles names within the modifiers, to define what users could view the data within the shortcodes. After receiving feedback from our customers, we changed this logic some time ago to user Client and Circle ID numbers instead, as this is a cleaner logic, and prevents issues in the event of actions such as renaming a Circle (as the ID number wouldn’t change). After additional feedback, we have now implemented the option to use either names or ID numbers within the shortcodes. Simply set up the shortcode with your desired usage of either names or ID numbers, and the shortcode will automatically detect which you are using and assign the protected data accordingly. It should be noted that this logic only supports names OR ID numbers separately, not both mixed together. This release also includes some bug fixes related to file sharing, client CSV importing, as well as some various CSS tweaks throughout the plugin (both frontend and backend). A few other minor bugs have also been addressed, in addition to the normal streamlining and text updates.